Calandra's Spring book: What's in a name? The story behind the book title. What's in a name? The story behind the book title. I've been asked lately to explain what the name of my book means. 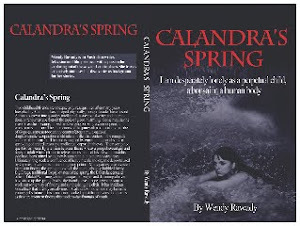 'Calandra's Spring' has a few layers to it: firstly, the book is about a spring, a geographical feature. Secondly, it deals with Calandra's own spring awakening, coming into adulthood (although in years she is already an adult). Lastly, Calandra is another word, Greek, tied to the meaning of the bird 'lark', the harbinger of spring in many cultures. It may seem a little obtuse, but by the end of the book, you will 'get' it I hope!! Oh, and please note that in writing this, I have tried to avoid the Oxford commas but with some resistance! !